ClearOne will demonstrate its new ClearOne VIEW Pro software upgrade at Digital Signage Expo (DSE) 2018 on March 28-29 at Booth #2017 in the Las Vegas Convention Center. First introduced at ISE 2018, the new and powerful software upgrade to its VIEW Pro solution makes it easier than ever to configure AV over IP streaming platforms that can unleash the full power of any enterprise digital signage system. A convenient web-based GUI is now available for installers to access from a web browser. Also, the configuration tools on CONSOLE software have been organized and redesigned for intuitive and simplified set-ups. This VIEW Pro system upgrade makes any installation a breeze from start to finish. With the VIEW Pro system’s new web-based GUI, simple tasks, such as assigning IP addresses, configuring streams, and even signal routing across a large installation can be done just by entering one device’s URL into the web browser. In addition to that, the VIEW Pro CONSOLE upgrade gives integrators the easiest interface to configure the encoders and decoders, and to create and manage AV streams for projects of any scale. ClearOne’s award-winning VIEW Pro product line offers the industry a comprehensive and powerful suite of AV over IP components, now with enhanced installer-friendly configuration software. 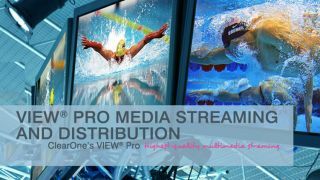 Along with its low bandwidth, highest quality video, flexible scalability, and budget-friendly optional software licenses for video wall, video composition, and local playback, the VIEW Pro system will meet the needs of any network media streaming project.